Do you have hands of successful business owners or outstanding entrepreneurs? How do you describe them? Whatever meaning successful entrepreneurships have for us they all have some common fundamental characteristics. They are nothing more or less than a simple tried and proven formula which most of the world's greatest success used in order to achieve the high station in life which they did. The first seed of success is that they all work hard. Their resources and strengths are their ability to work hard. Figure shows the hand of a Vietnamese immigrant in Australia who overcame life's obstacles to become one of the most successful industrialists in the country. Bearing an Earth Hand (square palm and short fingers) which indicates strength and practicality, the owner confessed that he never took a day off for a holiday until his major business breakthrough after 10 years. While other people are enjoying their dinners, movies or parties at night, he would stay back and work around the clock in the factory making sure orders were processed correctly that the merchandises were right and customers were always happy. Earth-handed people are able to lift themselves up to the top of the ladder of success in life because of their expended efforts. They work hard towards their goal and the chosen task is a labor of their love. Born to a family of 14 children, his early years were extremely difficult and the family was often on the break of starvation. His mother died when he was three and his father passed away when he was nine. In a community distressed by war and famine, he left his country for Australia in the 1970s as an aspiring immigrant hoping for a better livelihood and opportunity. Disadvantaged by his limited English and lack of locally recognized qualifications and work experience in Australia, the owner found it hard to achieve an employment status. He went through all kinds of bitter labor and harshness from being a newspaper seller to bartender, restaurant helper, laborer, general worker and machine operator. But with his Earth Hand and strong Thumb - see: A in Figure above - which show formidable will power and moral strength, he met his challenges with fortitude and enterprise and was able to overcome the many obstacles erected against immigrants. One day, he stumbled into a garment factory and picked up the skill of cutting, sewing and fitting female garments. Subsequently, with a small saving, he resigned from the factory and found space in his home and together with his wife, they worked from dawn to dusk sowing garments for other factories. He was fortunate to have a supportive wife. Figure above: look at influence line B arising from the Mount of Luna to join the Fate Line at C. This denotes successful union of partnership. Through the practice of frugality, industry and self-sacrifice, he began to accumulate wealth. Note his Fate Line D which runs from the wrist of the palm towards the base of the second finger. This gives him the concentration on the realization of material success first and then, having become successful, there will begin a search for the realization of the objective too. The economic crisis of the late 1980s and strong competition from imports from China saw the collapse of a great number of garment factories. Taking advantage of the situation, he ventured further in purchasing second hand machineries from these factories at cheaper cost. He then began to build his own factory and expanded to a size capable of handling mass production for the exports market. Note his straight Head Line E which gives him a calculative acquisitiveness and practical foresight which acts as a driving force of expectancy of better things to come. Now, with his garment factory standing proudly against hectares of lands, his merchandises span around the globe in million dollars. All who aspires to attain great heights of success will need some measure of self-training in the art of expression. Look at his wonderful Heart Line F which runs beneath the base of the fingers, ending in a trident on the Mount of Jupiter. Owner is able to speak 7 foreign languages, which gives him the ability to get along well with people. Thought-wealth and word-wealth are collateral possessions. Successful entrepreneurs have hands that come together in hard work, self-confidence, ingenuity and optimism. If you make the troubles to study hands, you will be able to see the whole of the physical, mental and emotional urges affecting them. Regardless the early circumstances in life, a good entrepreneur will have a pair of hand that can climb the rugged path of life and if he falls by the wayside, he will be able to get up and use the stumbling blocks of life to forge ahead. Who is Jackie Chin? Miss Jackie Chin is both a popular and successful palm reader. Trained under veteran Malaysia Palmist, Mr. Woon Kee Fee and a mystic and renowned Palmist in the UK, the late John Benedict. Jackie earns her reputation as a skilled hand reader unsupported by clairvoyance or other occult sciences. Jackie uses clear and distinctive handprints for a more scientific approach to palmistry and she updates her findings through constant research and study. 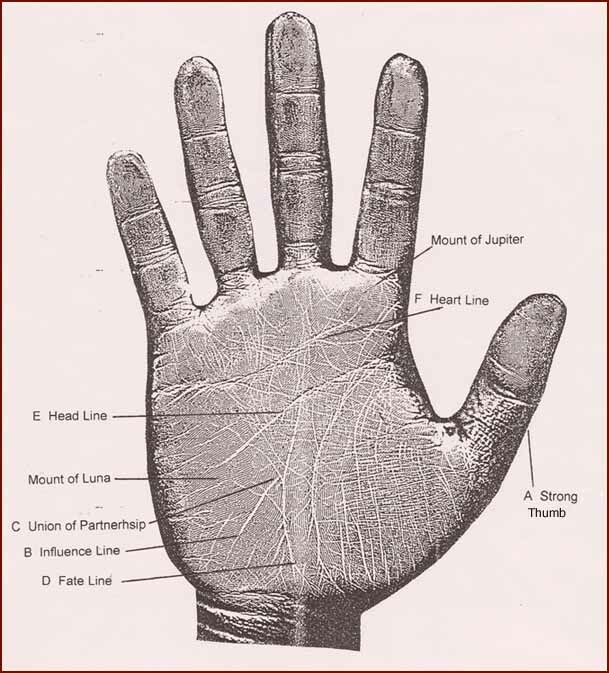 Find a Palmist in Malaysia! Find a Palmist in Singapore! The Simian Line: a notorious hand crease!